Feeling the Fear – and never doing it again! We spent most of this week in Singapore where my training plan went a bit awry but it was worth it to spend time in one of my favourite ex-home towns (and the birth place of two of my children). These over-indulged children, one of whom has a Forever 21 habit well beyond her pocket money allowance, enjoyed their third visit to Universal Studios Singapore. For the record, if asked, my kids will tell you that the have never in their entire lives been to Disneyland unlike ALL their friends! (All their friends have mobile phones too I’m told but that’s a whole other subject.) Back to Universal Studios. Obviously if my kids have been thrice, so have I. Lucky me! Three visits during which I have kept my feet firmly planted on the ground and my nose in my Kindle. I have never in my entire life been on a roller coaster though I suspect most of my friends have. I am terrified of heights you see. You’d have to kill me before you could coax my corpse onto any sort of ‘fun’ ride or helicopter. 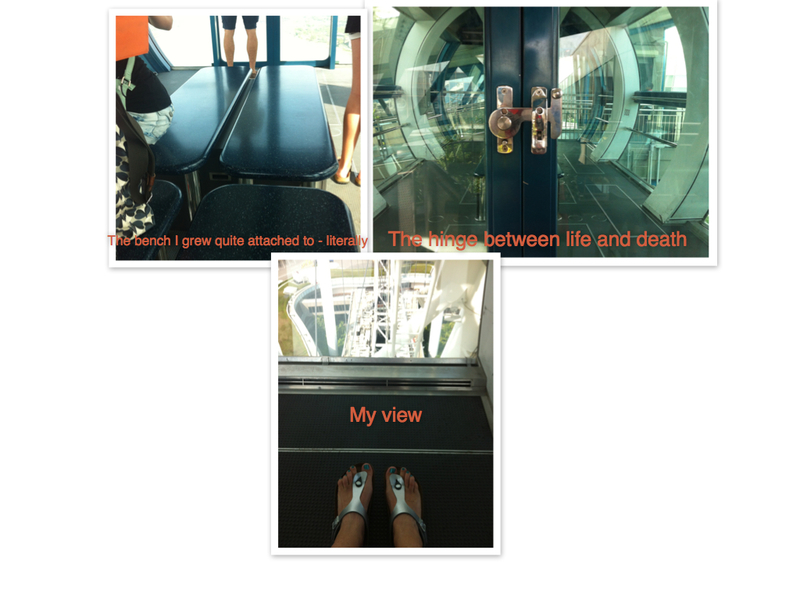 Which is why I went on the Singapore Flyer. Obviously. For those who haven’t seen it, the Singapore Flyer is like a massive ferris wheel from which hang multiple air-conditioned glass capsules that house up to 28 people. 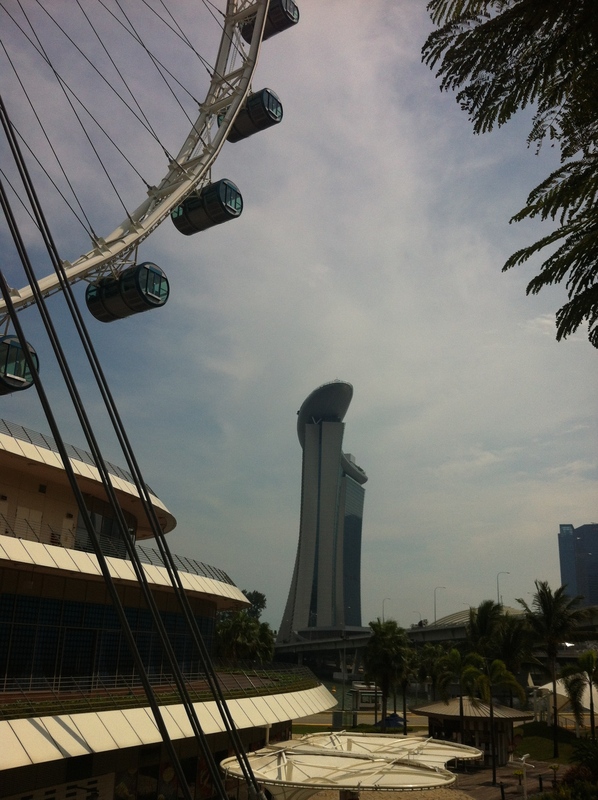 It travels very slowly so it’s not a thrilling ride per se but an opportunity to see Singapore from a new perspective. One of the things I am trying to do in my forties is live less fearfully; no mean feat for a chronic worrier with serious anxiety issues who thinks about death at least once a day, and more often at night. I’m very aware at how limiting fear can be, how it can drive you into an ever-shrinking hole of experience until one day your kids leave home, and you, living and working online, can no longer find the courage to ever leave home without some form of calming medication. I do not want to become that version of me. So, I’ve striven to push my fear aside by, for example, entering races, knowing that overcoming the fear of racing is in itself a reward, apart from any finisher medal. I got a tattoo figuring how sore could it be. Not very, it turned out. 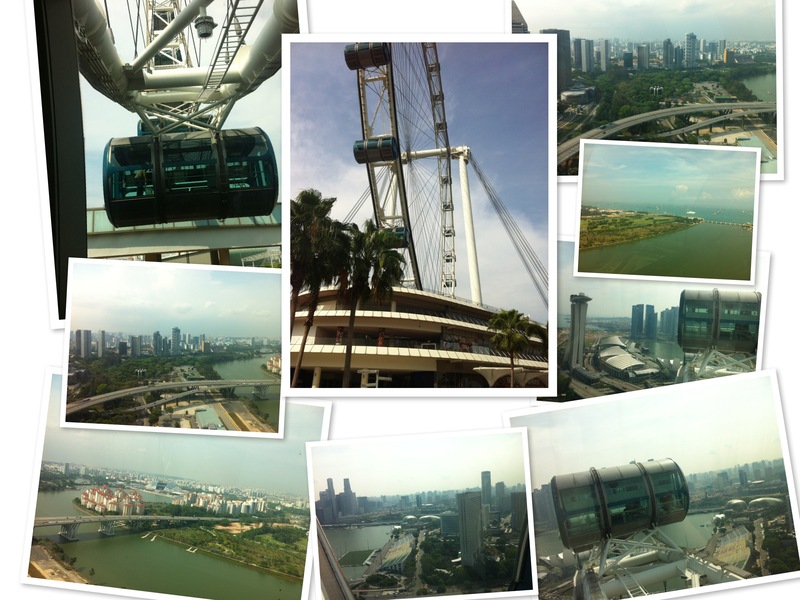 And so it was with the Singapore Flyer. I would continue my strategy of feeling the fear but doing things anyway in pursuit of feeling better about myself, and warding off late life agaraphobia. Anyway, how bad could it be? Ooh so bad! It seems that this vertigo thing doesn’t respond very well to cognitive therapy, not my version of it at least. Luckily we had the capsule to ourselves. After some initial bravado, as the wheel transported us higher towards the sky, I had the horrendous sensation of free-falling to earth. I needed to feel tethered to something to quiet the very real physical sensation of falling (to my death!) and clung to the benches in the middle of the capsule for dear life, keeping my eyes to the floor. I couldn’t even bear the sight of my children and husband walking freely around the capsule and shouted several times at my daughter to stand in from the edge. My husband took photos, and very helpfully called out interesting sights below, while I inspected my toes in need of a pedicure. Never have a pair of well-worn feet been so mesmerising. Thirty minutes of toe-watching, and the odd-side glance later, we were back on solid ground where I discovered that there had only been a mere metal hinge keeping the doors shut while we floated in space. One petrified woman’s flimsy piece of metal is apparently a robust hinge in the eyes of an engineer (my husband) but really when you think of it… I still get palpitations when I do. So I have realised that it’s not always a question of mind over matter. It’s completely useless to tell me how safe the Singapore Flyer is. Sometimes, our mind and body does have limitations and being more than two feet of the ground while conscious is one of mine. Funnily enough, I don’t mind flying (much) in airplanes, despite my anxieties and recent tragic events, but of course you won’t find me volunteering to sit in the window seat. And I can safely say that fearless forties or not, I will never, ever go on a roller coaster. Unless you are prepared to kill me first! If you are not terrified – I’ve upgraded my fear from scared, but don’t do it if you’re merely scared either – of heights, the Singapore Flyer is a great experience. More info at this website.